1. 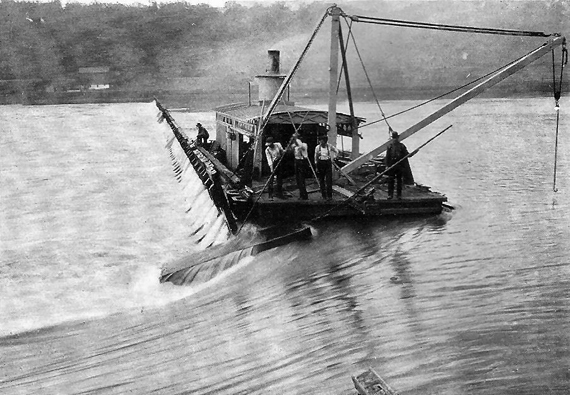 Federal involvement in improving the Ohio River for commercial navigation began in 1824, when Congress directed the Corps to find a method of removing sandbars and snags. The desired channel depths to be attained by this clearing and snagging program were 3 feet and 30 inches for the lower and Upper River reaches, respectively. 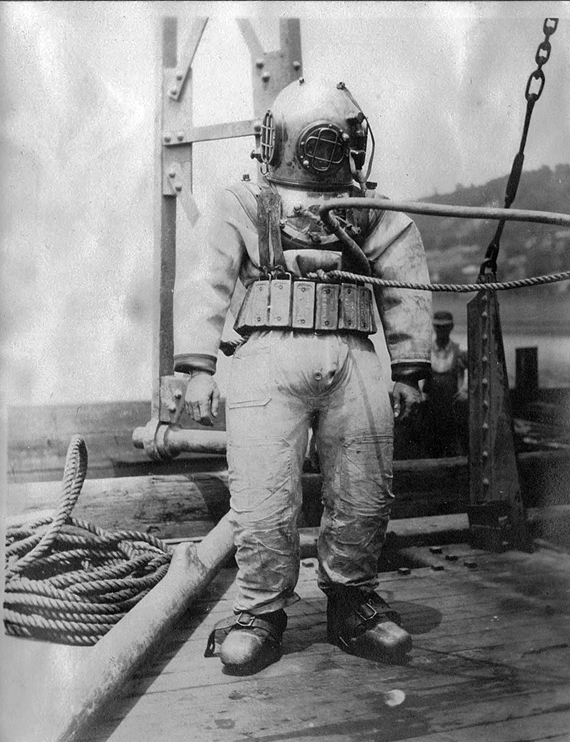 This depth was deemed adequate for vessels at the time, consisting of steamships, keelboats, and flatboats. By 1870, William Milnor Roberts proposed that a six-foot navigation pool along the entire Ohio River would be necessary to accommodate future navigation. It was estimated that sixty-six locks and dams would be required to provide this channel. 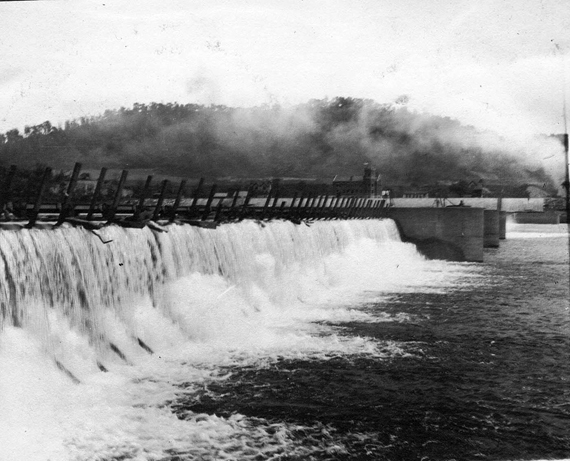 The River and Harbor Act of 1875 provided funds for the construction of a movable dam 4.7 miles downstream of Pittsburgh at Davis Island, also known as Lock and Dam 1. 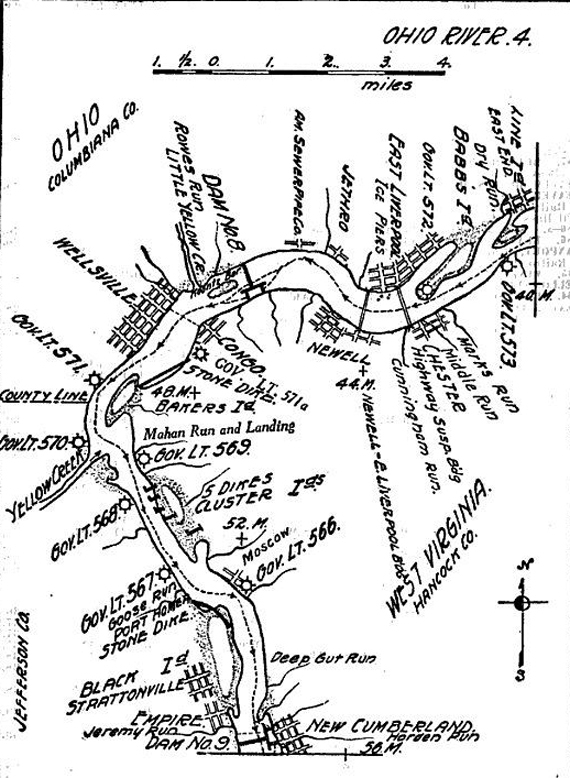 Federal canalization of the Upper Ohio River for 6-foot navigation was started in 1877 with the start of construction of Davis Island Lock and Dam. Completed in 1885, the project consisted of one lock chamber 600' long and 110' wide (600'xl 10') and a wicket dam which allowed traffic to navigate the river without proceeding through the lock in high flows. This was the only federally constructed facility in the nineteenth century. One other lock (78' wide) was constructed with funding provided by private sources and the city of Louisville in the Portland Canal that skirted the "Falls of the Ohio" at Louisville. The six-foot channel was never realized. 2. By 1908, Locks and Dams 2 through 6 were constructed extending down to Ohio River mile 30. However, by 1900, coal barge tows requiring nine-feet of draft were already operating on the Ohio River and a nine-foot channel depth for the entire river gained popularity. 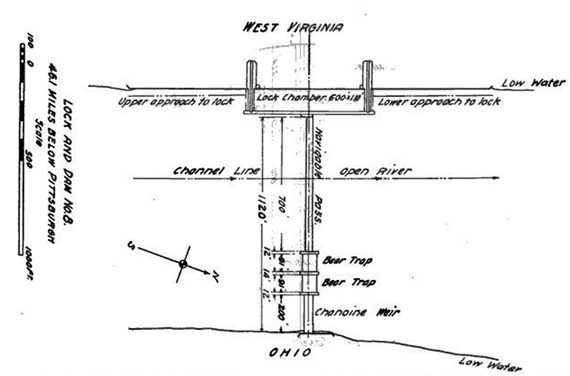 Subsequent to a recommendation by the Board for Rivers and Harbors in 1906, the River and Harbor Act of 1910 authorized a 9-foot slack-water navigation project for the Ohio River, with projects consisting of movable (wicket) dams and a single lock chamber 600'xl10'. The Act originally provided for the construction of 54 locks with movable dams and for the widening of the Louisville-Portland Canal at Louisville, Kentucky, and the construction of a new lock in the canal. This plan was modified with certain substitutions and eliminations under authorities of the River and Harbor Act of 18 July 1918 and 30 August 1935. The original Ohio River "project", when completed in 1929, consisted of 50 lock and dam structures and the Louisville-Portland Canal and canal lock and provided reliable channel depth of 9 feet. During this period, Ohio River traffic grew substantially, increasing from 10 million to 20 million tons between 1923 and 1925. Table 4.1 chronicles the construction history of the original Ohio River project (three left columns). 3. During construction of the original Ohio River project, it was recognized that fixed, non-navigable dams had some advantages over the movable (navigable) dams, particularly in maintaining permanent pools for the convenience of navigation and in providing better conditions for industrial development along the river banks. Accordingly, the River and Harbor Act of 18 July 1918 provided "That the Secretary of War is hereby authorized to modify the project for the improvement of the Ohio River in accordance with the report submitted in House Document 1695, 64th Congress, 2nd Session. The House Document recommended replacement of original Ohio River Locks and Dams 1 and 2 by the Emsworth Locks and Dams (where the dam was comprised of two sections separated by Neville Island) and dual locks. The original Emsworth project included fixed weir dam sections. The dams were reconstructed in 1937 with a low sill and vertical lift gates to provide a deeper and more stable pool at Pittsburgh. Dashields Locks and Dam was constructed under the 1918 authority to replace original Lock and Dam No. 3. Montgomery Locks and Dam; comprised of a fixed, gated dam was built under the same 1918 authority to replace Locks and Dams 4, 5, and 6. The sizes of the locks at these chambers were the same; 600' x 110' (main chamber) and 360' x 56' (auxiliary chamber). 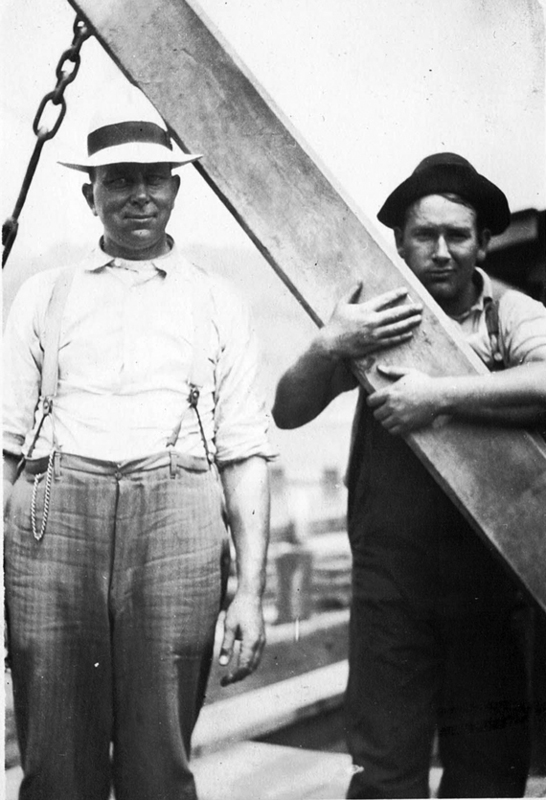 Congress also specifically authorized the Gallipolis Locks and Dams in the River and Harbor Act of 39 August 1935. That project replaced the three lower locks and dams on the Kanawha River and Locks and Dams Nos. 24. 25 and 26 on the Ohio River. It consisted of a single high-lift, gated dam and dual chambers, 600' x 110' and 360' x 110'. By 1937, with construction of Emsworth, Dashields, Montgomery and Gallipolis locks and dams, the total number of locks on the Ohio River reduced to 46. 4. Ohio River traffic in the early 1900's was highly dependent upon coal movements from Pittsburgh to New Orleans. Due to heavy declines in this traffic, which was diverted to steel plants in the Upper Ohio Valley, Ohio River traffic dropped to its lowest level in 1917, 4.6 million tons. Then, transportation demands of World War I severely overburdened existing overland transportation systems and river traffic increased. The original canalization project was completed in 1929. 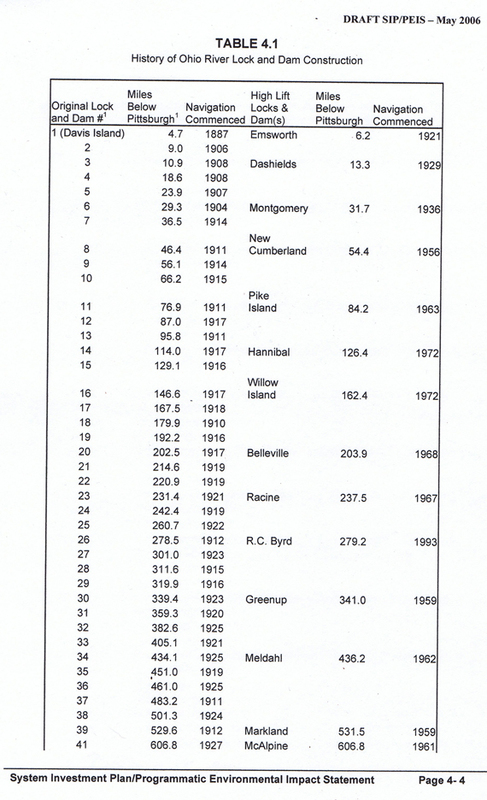 Ohio River tonnage rebounded to over 22 million tons by 1930. This waterway spurred economic growth and assisted the rapid nationwide mobilization during World War II. Sustained post-war expansion of the national economy increased the use of all types of commodities carried on the river. Oil and gasoline products moved upriver while coal moved downriver in great quantities. This rapid growth in traffic exceeded the government's ability to increase lock capacity and by the 1950s serious delay problems had become obvious. The original 600-foot lock chambers built during the days of paddleboats and wooden barges were obsolete and could not handle large modern tows in a single lockage. 1. As increased navigation costs began to affect the region's economy, plans were formulated beginning in the 1950s to modernize the original navigation system. The improvement plan developed called for the replacement of earlier low-lift structures with a lesser number of high-lift locks. The modernized structures provide higher-lift dams, with longer pool-reaches between projects, and larger lock dimensions. Modernization of the Ohio River Navigation System began in 1954 with construction of Greenup Locks and Dam, a structure with a 30-foot lift, a 1200 by 110-foot Main lock, and a 600 by 110-foot Auxiliary lock. The modernization program envisioned 19 modern high-lift projects, and this system will finally be realized after construction of Olmsted and the decommissioning of Locks and Dams 52 and 53, tentatively scheduled for 2009. The construction history of the modem high-lift projects is shown in Table 4-1 (rightmost three columns). The specifications for these projects are listed in Table 4-2. A map of the current system was show in Figure 2.1. 2. Improvements on the Ohio River Mainstem continue today at Robert C. Byrd Locks and Dam (formerly Gallipolis) located just upstream of Huntington, West Virginia; Olmsted Locks and Dam on the lower Ohio River; and McAlpine Locks and Dam located near Louisville, Kentucky (see Table 4-1). The last lock modernization project was completed in January 1993 at Robert C. Byrd Locks, where two new locks measuring 1200 by 110 feet and 600 by 110 feet replaced the outdated 600'xl10' main chamber and 360'xi 10' locks. The Olmsted project at river mile 964.4, which will provide a modern structure to replace Locks and Dams 52 and 53, will consist of twin 1200 by 110-foot locks and a new dam with submersible gates to allow tow passage over the dam during higher flow conditions. With completion of Olmsted, the number of Ohio River mainstem projects will be reduced from 20 to 19, The McAlpine project at river mile 606.8 will replace the old 600' Auxiliary Lock with a new 1200' chamber -- providing this site with twin 1200 by 110-foot chambers. The maneuver boat being used to lift the wickets. Fernbank Dam near Cincinnati, Ohio. Picture courtesy of Ohio River Main. See URL above. 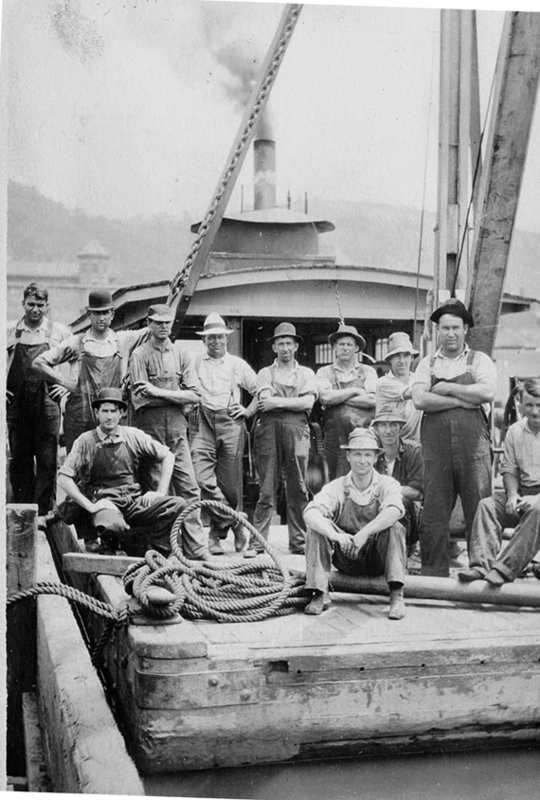 Dam 8 workers, the maneuver boat used to raise the wickets. From the album of Bernice H. (Thompson) Steinfield. Dam 8 workers. From the album of Bernice H. (Thompson) Steinfield. Wicket Dam inspections and work on the Ohio River in the ELO area. Time period probably 1910-12. From the album of Bernice H. (Thompson) Steinfield. Dam 8 between ELO and Wellsville.